Villan ligger 300 meter från stranden i Cala Esmeralda, 10 minuters promenad från centrum av Cala d'Or och 20 minuter från hamnen. Omgiven av en trädgård, i ett lugnt område, är det en idealisk plats för en avkopplande semester med familjen eller vänner. Huset är byggt i två våningar, på bottenvåningen är vardagsrummet, kök, två sovrum och ett badrum. På övervåningen, två sovrum med badrum, balkong och havsutsikt. På framsidan av huset, kommer en fin veranda kan du ta dina måltider från solen. Baktill finns ett stort bord och en grill för att göra stora partier av poolen. Beautiful, comfortable, clean villa in a perfect location. We recently stayed in this villa for 2 weeks and had a perfect holiday. The villa was extremely comfortable and clean. The swimming pool and gardens were well maintained. 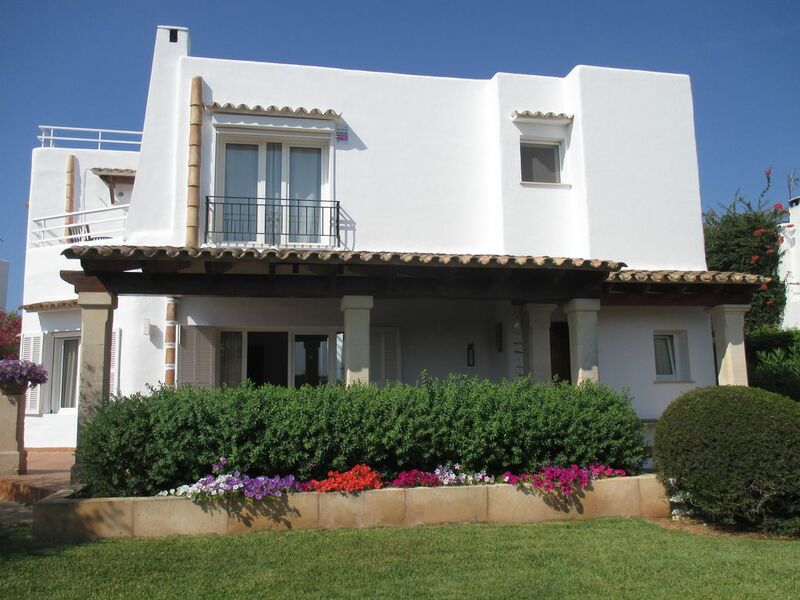 The villa is in a perfect location, on a quiet residential street but 2 minutes walk to the beach another few minutes walk in that direction are restaurants, bars and shops and the centre of Cala D’Or is a 10 minute walk. From the front balcony there are beautiful views of the sea. Florence was so friendly and helpful. We were arriving late at night but she kept in contact to ensure we had no problems arriving at the villa and also called round the next morning with vital information about the villa and the area. I would highly recommend this villa and would happily stay again. Good Villa in excellent location. The villa is generally in a good condition. Just what appeared to be a damp patch in the living room and in one of the downstairs bedrooms. Apart from that fine, loads of room in the villa & upstairs sunbathing if that's what you want. Florence was always available, particularly when my grandson slipped in the bathroom & cut his chin, which needed stitching. Florence came straight away to the villa & took my grandson, along with his father, to a medical centre in the centre of Cala D'or where every thing was dealt with efficiently. Just a tip here you need to take an EU medical card with you, for everyone who is travelling, this enables you to get free treatment for minor accidents without claiming on your insurance. The location of the villa is excellent, a small beach 200 metres away. Bars & restaurants just a bit further on. All in all well worth a visit, the centre of Cal D'or fifteen minutes walk, the Marina a mfurther 10 miuntes. Our party consisted of 6 adults,2 children and a 2 month old baby.The villa was spacious,spotlessly clean and superbly equipped.The pool was perfect for both adults and kids and even though a gorgeous beach was within 3 minutes walk most of our time was spent in the pool!! Bars,restaurants ,shops are within walking distance,10 minutes (at the most!! ),the marina is a 15 minute stroll away,so unless you want to go "touring round" the area, a car is definitely not required! We were very impressed by the welcome we received from Florence who was most helpful.We had no problems whatsoever during our stay but it was very reassuring to know that Florence was available if required.I cannot praise the whole process/stay highly enough,booking,communication totally stress free! This villa is must if you are looking for a relaxing holiday with family /friends.Well done Owners Direct!!! We will be returning!!! Wir - 4 Erw. und 5 Kinder - verbrachten 10 schöne Tage in diesem Haus. Die Bilder versprechen nicht zu viel. Man hat von den Balkonen und der Dachterasse einen tollen Blick aufs Meer bzw. über die Dächer von Cala dÓr. Das Grundstück und der Pool sind sehr gepflegt. Das Haus ist schön eingerichtet, sauber und bietet genug Platz. Die Küche ist zum Kochen und mit Geschirr sehr gut ausgestattet. Die Gastgeberin war sehr nett und aufmerksam. Ein Wasserschaden in einem Bad wurde sofort am nächsten Tag behoben. Das Haus liegt relativ ruhig in unmittelbarer Nähe zum kleinen, aber feinen Strand Cala Esmeralda. Wir waren im Oktober dort, man hatte noch Platz und es war ruhig. Im Sommer sicher sehr voll. Spacious accommodation, well equipped and ideally situated. We had a fabulous relaxing home from home experience and would most certainly return to this comfortable beautiful villa. Nothing was too much trouble for Florence who made our stay even more comfortable. Cala Dor has everything to offer and we would the location ideal. Thank you.